Who would have guessed my $2 Mario plushie would end up in a game?! Alright, I'll spare you that pun. So, as stated above, the 3DS comes with various pieces of software preloaded that utilize its special capabilities, Face Raiders and AR Games being the two to go to if you're looking to jump into some games right away. I'm not going to speak much about AR Games here, as this is not a review of that set of mini-games, but in my opinion they are better used as showcases for the potential of augmented reality in gaming than as games that can actually hold your interest for very long. To be frank, I tried them out early on, found them to be compelling as far as showing me some of what my 3DS could do, but didn't really have that much fun playing them, and haven't been back since. Face Raiders, on the other hand, is both an excellent showcase of many of the features of the 3DS and a decent game in its own right. When you start a game of Face Raiders, the first thing it will do is ask you to take a (2D) picture of someone's face, using two eye points and a mouth point to help you line it up right. The idea is to take a picture of the face of someone around you, but of course you can get creative as well; I've taken pictures of faces from books, magazines, game and movie cases, etc. as well as pictures of plenty of things that aren't even faces (no not that you sickos!) Your only limit is your imagination. You don't actually have to take a new picture every time you play, you can also select from previous faces you have captured, but where is the fun in that? Face Raiders will then superimpose this "face" onto various 3D models, which will be used as the majority of enemies in the game (the others being random selections from your captured faces.) It's not just a static image on a 3D model, however. Because you lined up the eyes and mouth nicely (you did do this, right? 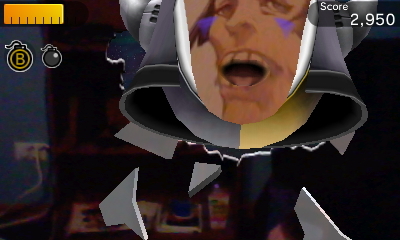 ), Face Raiders is able to animate the faces, adding various expressions to them, most of them downright hilarious. It's a small detail, but this game is made up of many small details, all of which combine to make a very polished whole. 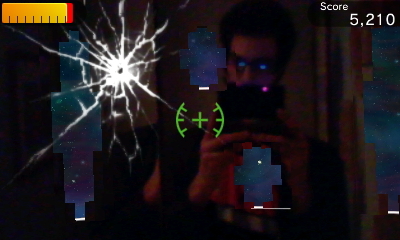 This is what happens when you use a mirror to play Face Raiders. Face Raiders itself is an arcade-like shooter of sorts, where you fight off waves of incoming enemies before facing off with a boss in one of its four main stages. There are also a couple of bonus stages where you have to keep juggling enemies without letting them drop off the screen, etc., as well as some shorter stages that fall under the heading "Show a Friend!" High scores are saved for all of the stages, albeit only locally; there are no online leaderboards or anything fancy like that. However, Face Raiders does utilize many of the major new features of the 3DS. 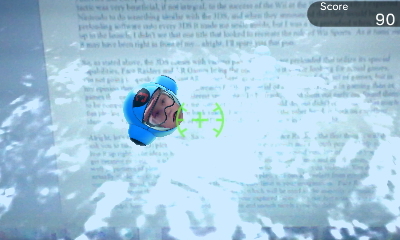 First, Face Raiders uses the two outward facing cameras of the 3DS to inject your surroundings into the game as the background, in real-time. I'm not sure if this technically qualifies as AR, as it is used only for the background and not incorporated into the gameplay, but it is still super interesting to play a game where your in-game environment mirrors your real life environment. And there is some visual interaction; the enemies in the game will burst holes into the background, turning your "reality" into a shattered world. This looks very, very cool. It also uses these cameras to "capture", in real-time, any faces that it detects in your background, pulling them into the game as well. I'm not sure exactly what kind of face detection software Nintendo is using, but it works remarkably well, and despite the fact that Face Raiders is requiring you to constantly be moving around, it captures faces without motion blur. Props to the first person who knows what game this guy is from! 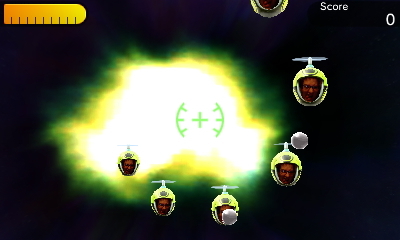 Second, Face Raiders uses the gyroscopes of the 3DS to control your aiming reticule, and it forces you to really move. In most stages you're constantly moving the 3DS around to hunt down enemies, at certain points even having to point it behind you, or at the ceiling. This is very reminiscent to me of some of the things that Wario Ware Twisted! did with its gyroscopes, which I found very compelling at the time, and still find very compelling. Of course, it means that if you are trying to play Face Raiders out in public, you might look a bit like a fool, but whether you want to risk that is up to your own discretion. It might actually be worth it to capture the face of a surprised viewer. What else? Face Raiders can be played in true 3D, of course. It is, admittedly, difficult to keep the sweet spot while moving around to fight off the faces, so I generally turn the 3D down pretty low for this game. But it's worth not turning it off completely, if only to see the pieces of your environment flying at you when the enemies burst through reality, or the silly expressions on your loved ones in full 3D. 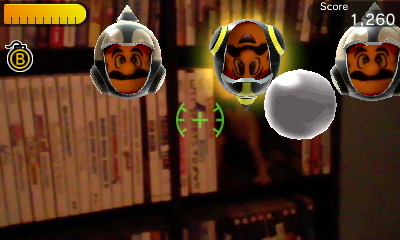 Face Raiders will also let you take pictures in game to save to your general photo collection on your 3DS, and you can do the reverse, as the game has a mechanic for searching out faces in photos you have taken with your 3DS camera and automatically importing them into your face collection, which, of course, makes them appear as enemies in the game. Is that sweet or what? Yes, that is my review text in the background of Face Raiders. WOAH. And that's pretty much Face Raiders for you. I feel, however, like I'm not conveying a huge part of the appeal of Face Raiders by talking about it without bringing in the context of experiencing it with your family and friends. Because, to be completely honest, if you take Face Raiders on its gameplay alone, it is a fun but ultimately limited experience that you can burn through in an hour or so. The real joy comes from sharing this unique gaming experience with others. I've played this game many times now, but I've also watched others play, and Face Raiders never fails to amuse. My nieces and nephews, for instance, were not only enjoying putting their faces into the game, but when not playing themselves, would run around waving their arms wildly to get into the background of someone else's game. People are intrigued by seeing themselves in a game, they're intrigued by seeing their environment in a game, they're intrigued by seeing how creative they can get with finding faces (or not even faces) to appear in the game, they're intrigued by playing it and seeing someone else they may or may not know pop up in the game, often with a hilarious expression. And of course, if they have any interest in the 3DS at all, they're intrigued by seeing the utilization of the special features of the 3DS like the cameras and gyroscopes. Face Raiders has something for everyone! There is something oddly therapeutic about battling against yourself. To come full circle here; do I really believe that Face Raiders can be the next Wii Sports? Well, maybe not quite. Whereas Wii Sports is a game with many different gameplay modes that you can play with family and friends for literally hours on end, Face Raiders doesn't have quite that level of depth and replayability. But I do believe that, like Wii Sports, it provides that initial hook which can get most anyone interested in the capabilities of the 3DS, and that it does so better than any piece of software currently available. Maybe it won't replicate what Wii Sports did for the Wii, but I think it will do a pretty good job of spreading the joy of the 3DS around nonetheless. And it's also a pretty darn fun game to boot. I'd probably pay five or eight bucks for a game like this. As a free, preloaded piece of software? Sold. Great review. Very thought out and you provided some nice photos to boot. I agree with the review and personally love the game quite a bit. I do believe that's Grit from Advance Wars. @DrFinkelstein Taking the photos was the funnest part! I had all kinds of ideas. One was to get the skyline of Chicago as a background. But uh... I live in the suburbs, so that would have been tough without taking a bit of a trip. Good review! And now I want to take a picture of Mr. Morooka for my own game! That'll show all those snotty kids, with their life-journals and their my-places. I don't know who that is. I still think it looks like Grit. I'm still a winner in my head! First, great review. Thanks for writing it up and putting all the info in there. One thing I did not realize about the game...you mentioned as you are playing FR, that the cameras will capture faces they detect in the background. Really? I have not experienced that yet, as I have not played the game in a room or place where other faces may be. I need to try this game in my living room more, as I have posters up and also several plushes,"Mario, Yoshi and Luigi"...I wonder if the camera would be able to capture the faces on the plushes? Or would they be too small for the camera to detect. Last night was the first time I played in my living room. I was sitting on the sofa and lazy, didn't want to get up and I had "Lord of the Rings" on my 42" plasma. Anyways, I tried taking another pic of my dog, but it was too dark, so I pointed the camera at the TV and when a close-up of Bilbo appeared I snapped the picture. WOW! I really had not thought of this and I got a perfect looking new FR to shoot at. After that game, I then took a pic of Gandolf and of Frodo. Even though I only had the TV on and the only other lights are the small xmas type of lights that I have up to decorate my living room, but man all the pics turned out really, really well! I hadn't even thought of taking pics of my plushes until I just read your review and saw the pics of the Mario plush you used. Anyways, I love Face Raiders. Its a really cool game and becomes really challenging. I like the fact that it forces one to get up to play the game. I did try playing just sitting down, and it was like the game knew what I was doing and kept putting faces directly behind me....so I had to get up. Like you mentioned about not being sure if FR will be on the same level as Wii Sports, its hard to tell. I actually only really liked the bowling game and while I did play the others, pretty much myself and my family members would stick with bowling. At least in my opinion, FR is pretty darn close to being at the same level as Wii Sports. Do I see myself playing FR as much as I did the bowling in Wii Sports? Probably not. My kids really like FR as well, but its not like we will have a ton of family sessions playing FR like we played Wii bowling. One last thing: I really love how FR and the AR games puts the background into the games. Both are really cool and it makes me wonder how this is accompished. Esp. with FR, you are spinning around doing full 360s and when there is a hole blown thru the wall, it always stays in the same place. What a really cool feature. I was thinking the first time I played the game, when I turn back around the hole will be gone or somewhere else, but its still in the same spot. Its really an awesome feature that makes me wonder,"How did they do that?" Even with the AR games, when the table, floor or what ever you have that AR card sitting on, starts to deform and take on different shapes. That is also really cool. Like I mentioned in other threads, I was never much into the handheld scene. But with the 3DS, there are things going on that one could never experience on a home console. 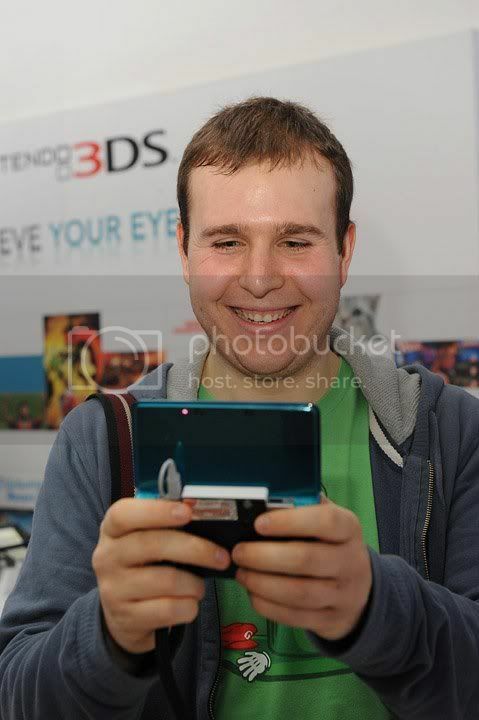 The 3DS does a heck of alot more than just play games and play them in 3D. Just like using the entire room you are in to play FR...you could never do that on a home console, cause once you are forced to turn around, away from your TV set, you wouldn't be able to see the game anymore. The 3DS is about as close to a VR without actually being VR as far as I am concerned. This sunday the weather is supposed to be in the low 80's and nice and sunny. I can't wait to go outside and play FR. I don't care if people see me looking a fool or not. Once I am immersed into the game, I will be oblivious to everything else around me. Thanks again for the review and some cool ideas I had not thought about....I'm off to take a few pics of my plushes. To be honest, while this game is fun, I don't find myself coming to it very often. Of course, when I do play it, I always have a blast. I totally agree about its social aspects too. It's just hilarious to see everyone's reactions. One thing I did not realize about the game...you mentioned as you are playing FR, that the cameras will capture faces they detect in the background. Really? I didn't realize it at first either, until my sister's husband (Mecha Koopa) said something about it. And I didn't believe him, I thought he was just confused, so I specifically tried it out and... he was right. It definitely grabs faces from your environment. Probably wouldn't work well with anything but real human faces though. Face Raiders uses the gyro to determine the degrees of deviation from a reference point in order to track the position of the in-game objects. It works very well, and is surprisingly accurate. AR games use polygonal meshes overlaying the images to create the geometry of the 'real world', and uses the image data to create texture maps that correspond with the poly meshes. What I find impressive is just how well executed these games are on a technical level. They must have really done their research. Damn! A red environment? I have no red rooms, or anything close to red...who the hell does? I'm thinking of about 5 different families that I could go to thier house and no one has a red room(environment)....guess I need to go out and buy a few gallons of red paint....only kidding. Seriously, where the heck could I find a red environment? I wonder if I went out and bought a bunch of red light bulbs and put them in my lamps and overhead light......would that work? Do you have a red environment that you can play in? Where did you find this info? The 3DS is a very impressive piece of hardware. In my opinion, what I have seen of the 3DS so far....and esp. since I was never a huge fan of handhelds...I can actually see myself preferring the 3DS, esp once a larger version is released, moreso than a new home console(unless of course that new home console has even cooler features). I've always been a huge fan of 3D, and I will be honest, I'm loving 3D gaming even more than what I thought. I really said wow when I first turned on the 3DS, I was more impressed than what I thought I would be. I love the fact that it seems like you are looking through a window into this other world. Well, keep in mind I'm using the term "environment" just to mean what the camera picks up. So you could take a red book or shirt or whatever and get super close to it. But I haven't actually done this yet, so I don't know exactly what would and wouldn't work. As for where I found the info, the game itself tells you in a "hint" after awhile. There is my Face Raiders review, I will never forget the first time playing it at the event in Bristol it was just so much fun. The 3DS made sense to me after playing it and it's still my go to game when I have a short amount of time to spare and I just want a quick fun gaming session. Nintendo really are the kings of intriguing, no nonsense software that really does encourage sales of a device. Great review too by the way, I think you covered all bases with this one. Question: On the 4th level which is considered the final stage, what is the deal with the "paddle looking' thing that keeps spitting out orange balls at you? I played this level probably around 20-30 times and actually beat the boss, but I have never defeated that paddle thing, which does have a face in it. I've hit the damn thing countless times and most of the time I just have to move around so its no longer in my view and I wait for the mass on orange balls to disappear. Eventually, the paddle will go away. I have tried hitting different parts of the paddle, but I cannot seem to destroy it. Can it be defeated and if so, just tell me what to do. I already beat the level. I took a picture of my plush Yoshi...at the end he looks pretty funny sporting "big hair". That one confused me at first, what you have to do is only shoot it once, and then when it shoots the orange ball back at you shoot the ball back at it... keep doing that a few times and you will beat it. I was thinking about that and I kept hitting as many orange balls as possible, but I quit doing that cause too much of my lifebar was being depleted. I never thought to just hit one at a time. I have just been into the face collection stuff in Face Raiders and I didn't realise there are quite a few options, you can choose to retake the photo, realign the picture so it animates better, adjust the gender, age etc.. and view all the expressions the face can make. As someone who hasn’t really spent a lot of time with Face Raiders, this review makes me appreciate the small details that make this built-in 3DS game really shine. As if warerare’s smiling face weren’t enough! I guess maybe part of the reason I haven’t jumped into it too much is I have not had a chance to show friends and family yet. I hope to remedy that soon. I’m so glad this game is part of the package. I just need to start getting more creative with my face captures so I can have more fun. Great photos, Zero. And yeah, I didn’t know the game would detect faces in the background as you play, that’s really cool. @warerare Wow, that's nice. Seems like there's always something new to discover about these 3DS games! We must be on the same wavelength or something. I just found that out as well last night. Some of the faces I took of myself, so it was hard gettting the pic lined up perfectly. Being able to adjust the faces is a really helpful tool. Does anyone know how to unlock the hidden stages? For the main game, I have Stage 1, 2, 3, Final Stage, "locked" stage, and then Extra Stage. How do I open the "locked stage?" For the Show a Friend game, I have Stage 1, Bonus Stage, and "locked" stage. Something nice might come out of red places! Well, that's what I hear, anyway! Yeah, I really wonder this is about!